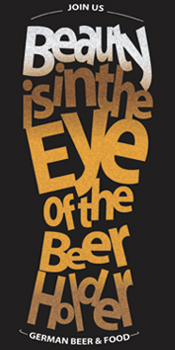 In 2012 there will be more craft beer and food events than ever. As the craft beer movement grows and matures beer and food pairings are coming into their own. Many establishments have noticed this phenomenon and are scheduling beer dinners, food and beer pairings and beer pairings with their regular menu items. This has been several years in the making and will continue this year. 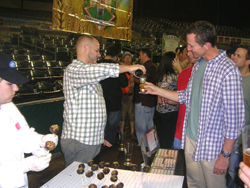 The year kicks off with the Field of Beers event the night before the Jupiter Brewfest. This event is all about food and beer. There are 16 stations each with a brewer and a chef with a pairing that has been created just for this event. See last years video here. Here, in south Florida there are more beer bars, brespubs and breweries opening. To keep up with all the action subscribe to my monthly "Beer Blast" e-mail. South Florida is one of the areas of the country that has room for growth for the craft beer industry. 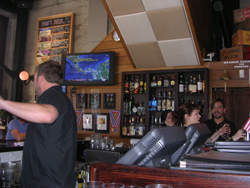 There are areas that have many craft beer venues; here we are just getting started. So, get out there and try some new beers and breweries and I'll see you there! My usual trips to the Sebring races, and North Carolina will happen. I aalways find some new beers then. 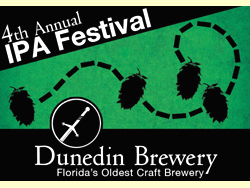 The Dunedin IPA festival is in June. In late August I am going to California. The trip will include Yosemite and Redwoods national parks. Local beer will be had whenever possible. 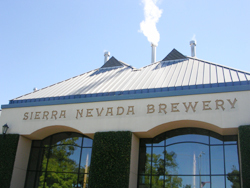 Sierra Nevada Brewery, North Coast Brewery and Russian River Brewing are all on the itinerary. Here's to beer travel! Wynkoop Brewing of Denver CO. has been running this contest for the last 16 years. I entered the contest three years ago for the first time. This year I revised and updated my Beer Resume and placed in the top ten for the second year in a row! This is quite an accomplishment in this prestigious national contest! The three finalists have been named and a top ten finish is great. I will try again next year! 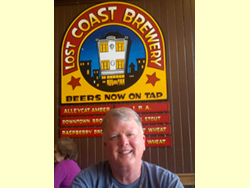 On February 25, 2012 J Wilson of Prescott Iowa was named the 2012 Beerdrinker of the Year. Congratulations to J a worthy winner for sure. Read more HERE. Florida breweries are really growing and making some great beer. 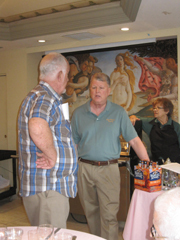 Tequesta is a great example of the growth and the good beer. Last year they were just starting up and now they are all over south Florida. I had lunch at a local eatery, Food Shack, and they had several Tequesta brews in tap. 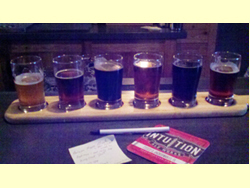 ( I really enjoyed the California Commons Ale and recommend Food Shack for great food too.) I have seen their beer down in Miami as well. This weekend they had an all Florida line up which would have been almost impossable a few years ago. 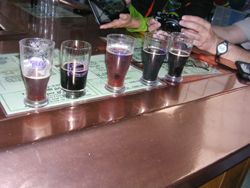 While at the brewery several beers were enjoyed; both Tequestsa's and other Florida breweries. 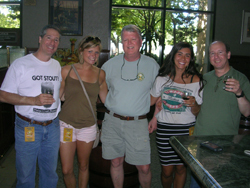 Green Room, out of Jacksonville had several as well as Cigar City (Tampa) Brewing. The brewer, Matt Webster, was there and our group met him and talked beer and heard about what they were doing for the coming events in Jupiter. (See below) Since it is a brewery, with no food service, they are allowed to sell growlers of beer to go. The Corner Cafe is next door and patrons can call for a to go order to enjoy with the good beers. Tequesta Brewing is a cool place to visit and have great beers too. We saw them out at both Jupiter events later that weekend. 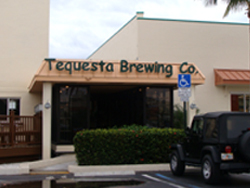 Tequesta Brewing's Facebook Page or Website. 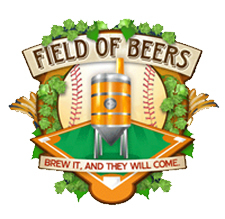 The fourth annual Field of Beers was, once again a great event. This year the weather was unusually warm and no sweaters or jackets were needed. The event brings together 16 different beers with special paired food dishes. I started in the left field dugout, at Roger Dean Stadium. A few highlights: First up was Brooklyn Lager paired with New England clam fritters fried in a sea salt batter with chipotle tarter sauce. Great start! Next door was Lobster Mac and Cheese paired with Florida Brewing's Florida Lager. Then came Coffee Rubbed Osso Bucco and grits paired with Tequesta Brewing's Vier a Belgian Quad. This was just the first three I visited. Several memorable pairings from the other areas: Wild Antelope and White Bean Chili paired with Saint Somewhere Cynthiana Belgian Ale. I would like to get this recipe so I could make this dish. La Caja China was a Smoky, slow roasted marinated whole pig with “Rincon Heat” gourmet hot sauce paired with Brewzzi Double IPA. This style is new for Brewzzis which usually brews German styles. They have a new brewer who is trying new styles to reflect the changing market in craft beer. Good job. There was Fresh Florida Wahoo Ceviche Marinated in Ligero Lager with onion, mango and cilantro paired with Cigar City Ligero Black Lager a traditional German Schwarzbier. Dogfish Head beer brought their 120 minute IPA and paired it with NY Style apricot cheesecake on a stick, dipped in dark chocolate, rolled in smoked toasted almonds, and finished with gingersnap dust. What a combo! The intensely bitter and hoppy IPA went well with the incredibly rich cheesecake "pop". For the complete menu click here. The event was small enough to meet people; participants, brewery reps and cooks. There was ample time at each station; however it is hard to keep moving so they all can be tried. The focus on Florida beers and food was really good to see. Florida has come a long way in a few short years. Look for tickets in December if you want to go in 2013. The sixth annual festival theme was "We'll Leave the Tap on for You!" The entrance went smoothly; the organizers have it together by having 2 lines and limiting the attendance. Once inside the taps were, indeed, on. A map is handed out so you know where favorite breweries and new ones are located. It is crowded but there is enough space to make it work. 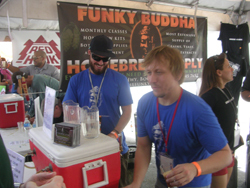 We headed over to the Funky Buddha, a local brewery, as they always have something interesting. They had Apple Pie a beer that tasted like you had just had a piece of apple pie. I am not a big flavored beer guy; this was good but I probably won't have several on a Friday night. next door was Victory with several selections.. Swamp Head Brewing, from Gainesville, was there with all six of their beers available. 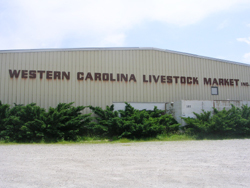 They aren't in this market yet but will go statewide at some point. 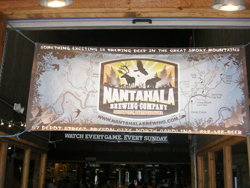 Existing Florida breweries really have taken off; they can't keep up with demand. Swamp Head is one good example. The beer is good too! 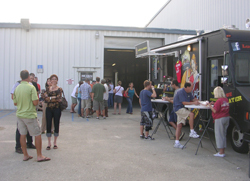 Tequesta Brewing and Brewzzi were next door; both with local beers available. The brewers were both there for the festival. 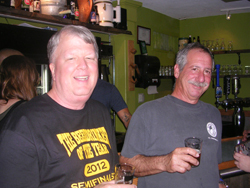 Tequesta brewing just celebrated their first year in business. 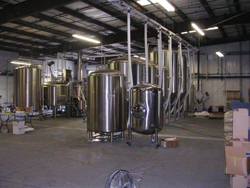 We then headed across the festival to Due South Brewing a new local (Boynton Beach) brewery. 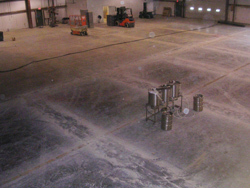 They are still building the brewery but had some beer ready. The brewery will open in March; meanwhile they are getting their beer out for people to try. They had a good IPA, Caramel Cream Ale, Porter and several rotating beers. This new local brewery was very popular. On my way home I stopped by Due South Brewery, but there wasn't anyone home. Now I know where they are. (A minute off I-95 and Gateway Blvd.) Bluepoint Brewing was nearby and had their IPA and BP Toxic Sludge available. The IPA is excellent and the Toxic Sludge was from the Field of Beers event. It is a Black IPA with extra malts for a hoppy yet malty dark beer. Rob, the national sales manager said that it was so popular that they are going to add it to their regular line up. (It was a one off beer.) We talked beer for a bit then I met some folks that liked my beerdrinker shirt. One lady's name was Wynkoop and she had never see the name like this. She said the name was Danish and I didn't know where the brewery got their name. (They named it for the first sheriff of Denver.) The music played on and the festival was at full speed. We found Green Room Brewing with only their IPA left. (That was fine with me.) Bold City was out but Sierra Nevada had something. I wanted to try their new Rye IPA but it wasn't there. (Why? A beer festival is all about introducing your beers to new customers; a new SN beer doesn't come out every week!) Greenman Brewing was a great wooden table with 4 taps running the entire festival. They are from Asheville, NC and may expand to Florida in the future. They are making some good beers and have a new brewery with additional capacity. 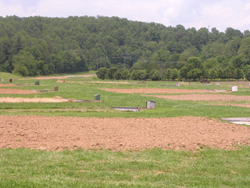 This was the fun area of the festival and where we would finish it. By Twisted Pine there were some folks that really enjoyed the "Billy's Chilies" beer. They were carrying on about it and I tried it. It has a much accented pepper taste throughout the tasting. It would be good with Mexican food but it's not a drinking beer. The Hoppy Boy is a decent IPA I would like to try it on tap sometime. Cigar City, Lakefront and Brooklyn were all near this area. Our day finished at the Holy Mackerel table where founder and brewer Robert Gordash was there and they had several beers on tap. There were pitchers of Mack in Black an Imperial Black Ale. I had a couple of beers and met some fun people who were taking pictures of everyone and having a good time. My day finished there as closing time came. The word went around that everyone had to quit pouring and start to head out. I did manage to get a lady to take my picture, in the Beerdrinker shirt, and got it sent to my e-mail. That picture is on this page just roll over the Jupiter logo, to the left, to see it. It was a good time and I represented the Beerdrinker of the Year well. This is a great fun event where "good people drink good beer" See you next year! In February I visited another new Florida brewery, this one in Hollywood on the boardwalk by the beach. 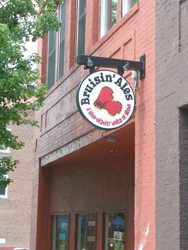 This is an unusual location and this is not a typical American brewpub. It really is a German beer hall that makes their own beer. As you walk in the beer making equipment is in a small room to the right. 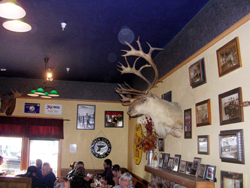 The main room has a high celing and is decorated in the beer hall style. 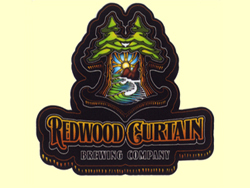 The owners have several successful brewpubs in Hungry and Russia and want to bring a piece of this to Hollywood. The menu has a good variety of German food; much of it made here on the premises. The night I was there there were four beers on tap. They had a Pilsner, Pale Ale, Wheat Beer and a Stout. I was able to try all four and found them to be authentic German beers. My favorite was the wheat beer, served in a Weitzen glass and quite refreshing. It will be a hit this summer with patrons coming off the beach. The food is good with much of the prep being done right on the premises. The home made sausage was cooked to order and excellent. My party tried many different items and found them all to be of good quality and taste. One dish was served with 'cartilage' still in the meat. Strange; it must be a German dish we weren't familiar with. All the food went well with the beers and our server was helpful; telling us what some of the dishes were and what beer they went with. It was a quick visit and I would like to return this summer to see how they have progressed and what new brews they will have. Update: This brewery has morphed into Hollywood Brewing with the brewpub at the same location and a production facility nearby. There have been many changes so another visit is on order. As is tradition, in March, I attended the 60th anniversary edition of the 12 hours of Sebring races. I have now been there for over half of the races. This was my 31st year. This year I went along with my two good beer loving friends with many different beers. We arrived on Friday and, once again, would camp out for the night. Late Friday afternoon we had a friend racing in the historic races. He now has a historic Porsche 914 that raced and won class at the track in the early 1970's. (He added to the history by winning his class in this race.) We had several different beers; I found all four of the Sierra Nevada 30th anniversary beers so, once again, they were enjoyed at the races. Late Friday night (or early Saturday morning) we met a group that was walking by and good beer came up. They invited us to their campsite for a St Patrick's day "Irish Car Bomb" a drink to remember. They pour half a glass of stout then drop a shot glass of Irish Cream and Whisky into the stout and the entire thing is drank quickly like a shot. After the first Patrick's day drink we found out that the group was from Jacksonville, FL and brought several local beers with them. 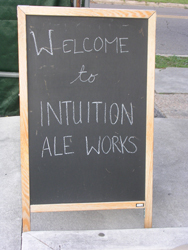 Intuition Peoples Pale Ale is a hoppy pale ale that comes in cans. We have not seen this beer before. Looking at their website they are making many great ales. Another new Florida beer! Great, our state is moving up in the brewing world. (Road trip to Jax?) On Saturday we stopped back by and brought them some beers that they had not seen before. We walked all around the track and enjoyed one of the best weather days in my 31 years. Later in the afternoon we would head to Orlando to explore the local beer scene. There was one more celebration left with our race winner. Several special beers were opened for this; Dogfish Noble Rot and two of the Sierra 30th beers. Overall it was another great Sebring and it is always good to see and party with old and new friends. 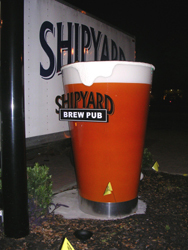 Once in Orlando we had dinner at the Shipyard Emporium and retired for the night. On Sunday we slept late and enjoyed a local state park in the early afternoon. We were ready for a beer about 3:00 so we drove over to a craft beer parlour we had heard about, Redlight Redlight. The pub looks like nothing special from the outside. However, once inside, there are hard to find and unusual beers on tap and in bottles. 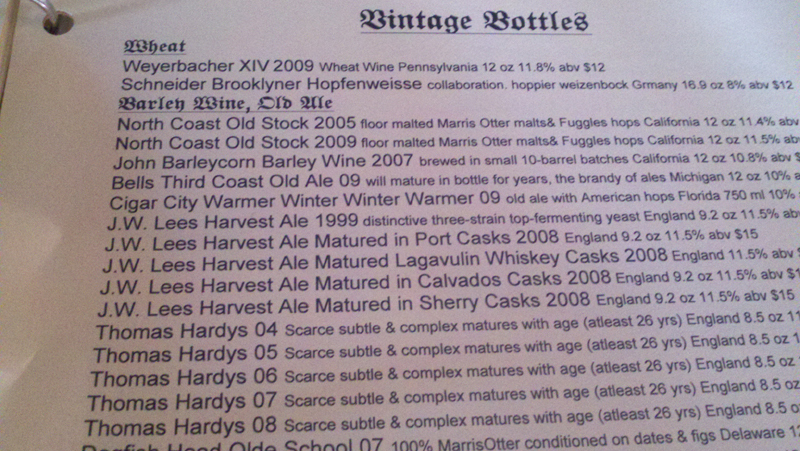 They have a vintage beer menu that will stand up with the best. We decided on beers and soon met several friendly locals. It's all about beer here and most of the patrons were of the same frame of mind. We were able to enjoy several beers we had not seen on tap. There was talk of a new location opening up nearby but I think this older place has the real character. No ferns or bad beer here. While we were there two kegs blew and both were replaced with different beers. (Typical in the craft beer world.) I went to the car and noticed a 1967 Camero that looked original in the lot. We soon met it's owners and made two new friends. They live nearby and enjoy the craft beer like we do. After a while we were thinking of heading on they said they would show us another craft beer place nearby. My friends rode in the back of the convertable over to the Milk Bar (Across the street from TG Lee Dairy.) This is a cool small beer bar for locals and it isn't on most maps. We had beers and sat on chairs that could be in a living room. Comfortable and laid back we enjoyed the time with our new found friends. This was great to meet some locals and go to places we would have not found ourselves. Since it was Sunday there was no food servce so everyone had to head on. They went for meatloaf pizza and we headed over to BJ's Brewhouse for dinner. Orlando was fun today. 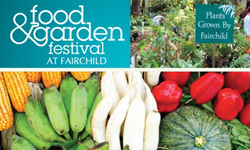 The 33rd annual food and garden festival has garden and local cooking demonstrations on two weekend days in April. There is also a plant sale at the festival. My demonstration was on Saturday April 14 at 11:00 AM. The garden demo tent was set up with chairs for about 50 people. My lecture was on spring and summer beer styles. We had a fairly dry spring but not this morning. It rained overnight and for the early part of the morning. This didn't help attendance but, as it goes with me and beer, the rain stopped about an hour before the demo. My lecture started with a few people and finished up with the tent almost full. The latecomers kept asking beer questions which held up the next plant demo which was running late anyway. After introducing beer styles in general I then spoke about the different styles of spring and summer. Spring styles include Maibock, Lager, Belgian Amber Ale, Red Ale, Irish Dry Stout and Wheat Beers. Summer styles are Hefeweizen (German wheat beer), Belgian Wit, Pilsner, Helles (German Light Beer), Kolsch, Blonde ale and Lagers. 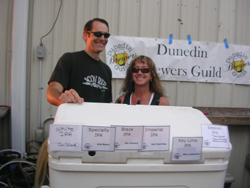 The beer sampling area was now officially open and the group was able to try most of the styles they had learned about. 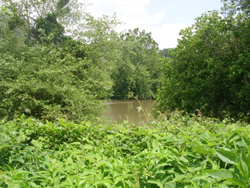 Festival Website - also links to current events at the garden. 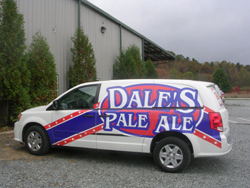 Asheville, NC New Brewery "Brews Cruise"
In late May, I spent a week in western North Carolina at my home in Highlands, NC. 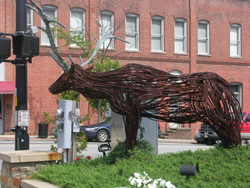 As I usually do, I took a day trip to Asheville, as I really enjoy the city and it's local beer culture. 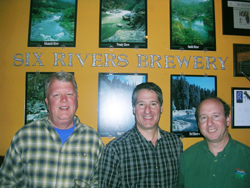 I know that three established western craft brewers are building their east coast breweries in the Asheville area. The idea here was that I wanted to go find each location, see where the new guys are planning to build, and take some "before" pictures and get a feel for the areas where they are going to build. 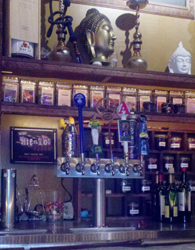 The three are: ( in order of the trip from Highlands) Oskar Blues Brewing, Sierra Nevada Brewing and New Belgium Brewing. The day turned out well; I found all three and did a few other beer related things as well. 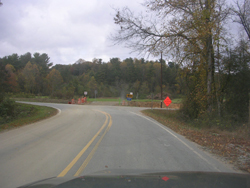 Update: The trip was repeated in October; I found progress at all three and some surprises. 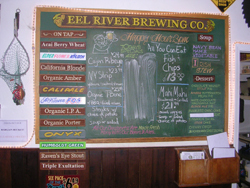 Each brewery has been updated to reflect current information as of October. On August 9, 2012 this event was held at the Eggersmann USA showroom at DCOTA in Dania. The event was on 'Kitchen Day' when all the kitchen showrooms had special events. The theme was all things German; beer, foods and kitchens. Working together with the Eggersmann staff this event turned out great. There were over 15 different German beers; most paired with the various foods at the event. To start the event I gave a short history of German beer including mentioning Reinheitsgebot the German Beer Purity law. The law states that beer can only contain 4 ingredients: water, malted barley, (or wheat) hops and yeast. All the beers at the event were brewed following this law. There were 4 food items with several beers paired with each. Roast Beef and Horseradish on Brioche paired with Helles Lager and Pilsner. Veal Meatballs Beer Braised with Weissbier and Kolsh. German Sausage and Potato Skewers paired with Dunkel and Schwatrzbier. Black Forest Ham with apple Beer Butter paired with several Dopplebocks and Oktoberfest. Some favorite beers form the event: Weihenstephaner Helles, Schneider Edelweisse, Bischoff Black Lager, Spaten “Optimator” Dopplebock (with Ayinger "Celebrator" also enjoyed) and Spaten Oktoberfest. The Aecht Schienkerla Rauchbiers (smoked beers) interested many as well. Overall the event went well; people tried beers then came back for favorites later. The attendance was great and everyone had a good time. Eggersmann hopes to do something similar again. Event photos on my Facebook Page. View my original invitation and event page. On Thursday August 23, 2012 I flew west with two friends for a 10 day vacation in California. This trip was all about hops and parks. We would visit 11 breweries and many different state and national parks. From San Francisco down to Monterey, across to Yosemite leaving via the eastern road to drive north to Lake Tahoe. Then we would drive west to Chico, continue west to Humboldt County and the Redwood Forests. The trip would then head south along route 1 then east toward the Sonoma Valley and back to San Francisco. The first stop was 21st Amendment Brewery for lunch. We arrived around 1:30; it was still busy from lunch but 3 seats were available at the bar. We settled in and took in the place and beer menu. 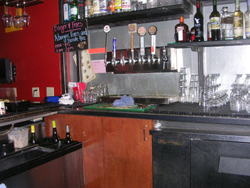 The front is a semi - circular bar with a large room of tables behind. The open kitchen is at the rear behind the table area. It looks like it could get busy as there is an entire mezzanine above with it's own bar. A couple of locals, who worked nearby, were seated next to me. 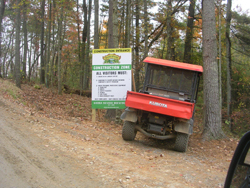 They told me that it iis an up and coming area and many new businesses were opening here. They work nearby at an on - line firm and have lunch here once a week. The menu offers 8 beers; I ordered the Live Free or Die IPA, a very drinkable, hoppy west coast IPA at 7.0% ABV. The amber and stout were also ordered. Our bartender was Billy, who took care of us with good service and details about the beer. He is a Cicerone CBS which showed in his beer knowledge. He showed us the 4 beers that they now are canning; several of them are hard to find locally, but are here at the brewery. Hop Crisis Double IPA was one; we got one to try later. Meanwhile, we were deciding on lunch. The menu has many good things on it and there was a board of daily specials. I had chili and the pulled pork from the specials board. While lunch was being prepared we tried some samples of other beers. Hqt Egyptian Ale would be good for my beer history class. Several breweries have made Egyptian beers based on what we know was available for brewing at that time in history. Hqt is made with Emmer wheat, honey, and dates using Egyptian herbs and spices instead of hops. It was a golden color, slightly malty and sweet. The Hell or High Watermelon Wheat also was tried. When lunch arrived, I ordered Batch 800 Double IPA which came in a goblet type glass. It was strong, 9.1% ABV but had no classic aroma as the Live Free. My favorite here was the Live Free IPA, the classic west coast IPA. I wanted a pint glass and was surprised at the low price. So many places want to make max money on everything they do. The manager told me that they sell them cheap so many will buy them; thereby getting their name into many more places. Overall, a good visit and a great start to the California trip. Website: 21st-amendment.com Roll over photos for additional shots. 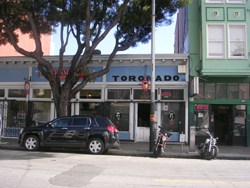 Our next stop was The Toronado bar on Haight Street. 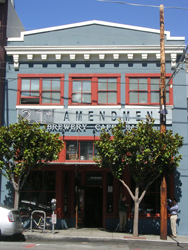 It wasn't far form 21st Amendment and we found parking directly across the street. Walking in, it was pretty busy for a Thursday afternoon. It wasn't completely full as we were able to get seats at the bar fairly quickly. It is a very cool, funky old beer bar with 50 plus beers on tap. 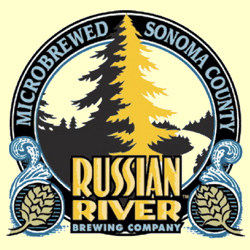 I ordered a Pliny the Elder, a double IPA from Russian River Brewing. My friends ordered Deschutes stouts. Service was fine despite what some reviewers say. 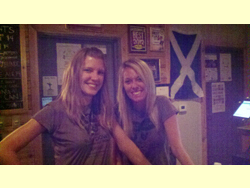 Our barmaid was Jennifer and she gave us good service and knew about a beer that one of my friends was looking for. The place is beer centric with all kinds of breweriana in every available space. 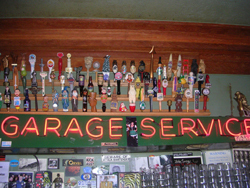 There is a huge tap handle collection and all kinds of beer signs on the walls. I could spend some time looking at everything; this collection has some cool stuff. The small back rooms also have more beer stuff on the walls. I got a few pictures around the place; I probably looked like a beer tourist at the time. A local, sitting next to us, said that if they know you and you know how the place works, you should be fine. We had a good time and everything went well. The Toronado was 25 years old in early August and still had some of their 25th anniversary ale available. It was made for the occasion by Russian River brewing. I had one; it was a very drinkable sour beer. I must be getting used to them as several years ago I probably wouldn't have liked it. 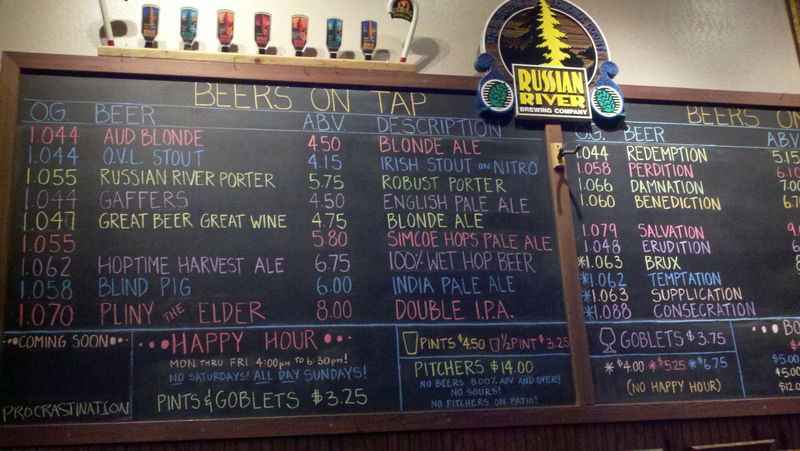 Also, Russian River is making several sour beers and doing well with them. 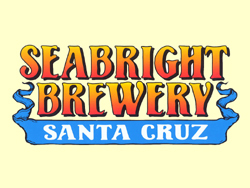 We would try them at the brewpub later in the trip. I wanted to try one more beer that I didn't know. I chose Moonlight Brewing Bombay by Boat IPA. The beer was from cask; smooth and it had piney aromas when starting. It was a tasty IPA and, as I found out later, from a small brewery in rural Santa Rosa. It was a good west coast IPA with a big hop taste and nice bitter finish. We needed to get going; I could have stayed for the rest of the day. Jennifer was leaving and the next shift was coming on. (Dave?) Everyone we met there was cool and into the beers. The place has a cool vibe and I can see why the locals like it. The prices were good, too; look at the beer menu I posted and compare quality, quantity and price to almost anywhere else. We were able to try Rosamunde Sausage Grill, next door. We got sausages to go and brought them back to the bar. The sausages were excellent; an added convenience of the Toronado. I have always said that dive bars can be some of the best places, and the Toronado certainly qualifies. When in SF, be sure to stop by. Website: Toronado.com For August 23, 2012 beer list look HERE. After our first viewing of Redwood trees, just north near Fenton, we returned to Santa Cruz for lunch. The morning was cloudy but cleared into a beautiful day by the time we arrived at Seabright for lunch. It wasn't too busy and we tried several of their beers. I found a good IPA and my friends liked the stout. There were several other good beers listed that were out. It is a friendly place; our waitress was good and I met several locals when I was looking around the place. They have been here for over 20 years and have a good local following. The brewing area looks small and tight but if it works why change it? We didn't meet the brewers but there is an old interview on the Beer Channel. It was time to go; we headed south to Monterey. Website. The second annual event was on October 13th. I made this the first day of my fall vacation. I had VIP passes and it was well worth it. The line in was shorter and having a separate area to go to and relax in a large tent with different beer and food vendors was great. Overall I enjoyed the festival and was able to access most booths easily. By the entrance Titanic and Brewzzi were there with good local beers. There was a big tent with several home brewers with beers to try. Out in the middle area there was almost every beer available in south Florida. Overall it was a good festival; I meet many local craft beer folks and handed out cards for my beer classes. More photos on the GBL Facebook page. My day ended at Cervezas enjoying Dogfish beer. The festival went so well that the promoter is thinking about a spring event. Stay in touch by signing up for the Grovetoberfest e-mail list. 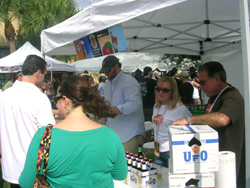 The first annual FIU Brewers Bash was on Sunday Nov. 4, 2012. 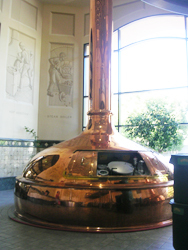 The FIU Hospitality School has a Beer Academy teaching different levels of brewing. This event gave the students a chance to run an entire festival and pour some of the school brewed beers. 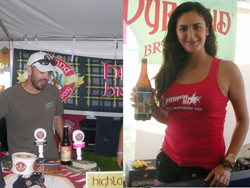 Vendors included local home brewers and commercial brewers. Most area breweries were there; Titanic, Brewzzi, Funky Buddha and Due South. Some small home brewers included Pank Home Brewers and Subvert Ales. 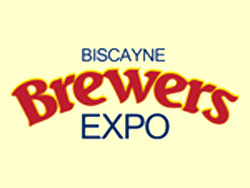 This was a small venue so we could meet the brewers and students on a beautiful day with Biscayne Bay in the background. It also was a chance to meet craft beer folks from different areas of the business and try some of their beers too. Photos on FB Page.